The origin of this design came to me many years ago when playing around with my pencil and sketching IOM boats as I often do. I drew a round deck shape with no gunwale and I thought this probably would work, but I will be laughed at!! OK, I said, you can design it! Well, where do you start? We had a TS2 and we remember what the late Geoff Smale said to us while we were sailing at the laser 24hr race at Lake Pupuke, Auckland. Nathaniel did this and built the Spitfire design. We built a plug and a full mold for this boat. Spitfire was a solid glass boat that did need corrector weights. 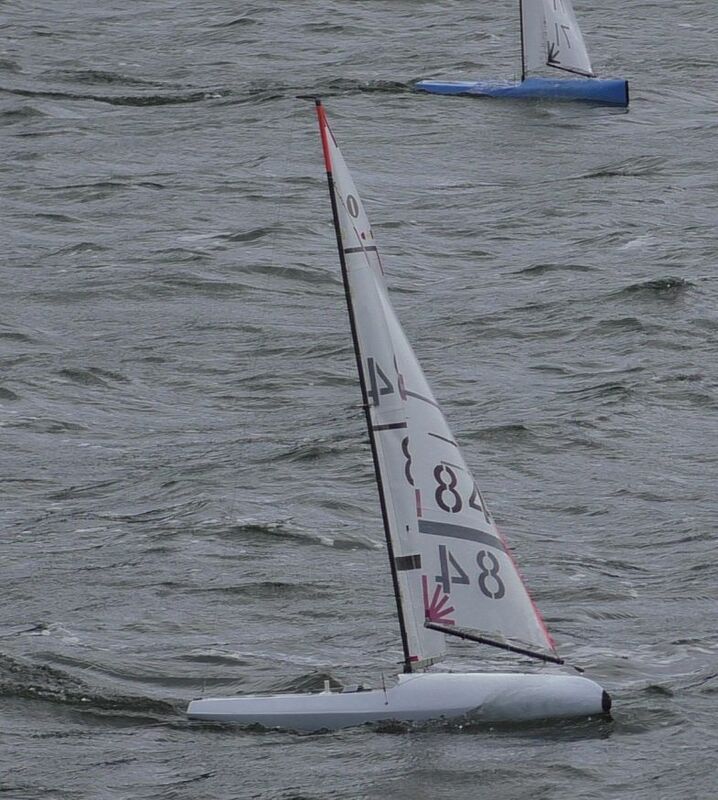 That boat has proved to be exceptionally fast by beating the NZ top design V 8 in our club racing. Well , because Nathaniel was doing it, I couldn’t sit back so I got my old sketch out. 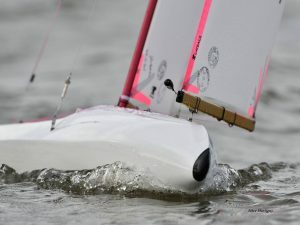 I had recently been sailing a F12 catamaran that had wave piercing bows and was very impressed with how this boat did not slow down when going for a nose dive, in fact it would always pop up again without cart wheeling. Also it would go through any chop on the wind without slowing, so I was very impressed with the wave piercing or back to front bow boats. When I saw the chine and tumble home topsides of the Brit Pop I realized this was the way to go as it would help to lift the bow and sink the stern when leaning over. 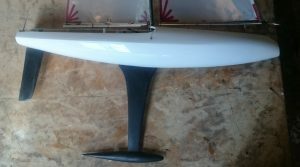 I copied the TS2 keel rocker line and made the boat 185mm wide and made a hard curve on the bilge before the chine in section view to help with stability, I added a flat area on the stern to promote surfing and tracking in the breeze. This boat was built using strip plank balsa that was glassed both sides. The boat was built in female molds. This construction eliminates any twisting that can happen when adding frames or the deck to the boat while under construction. The boat is completely finished inside before taking out of the molds and fairing glassing outside. When building the boat I took a bit of rocker out of the keel forward to help stop nose-diving so in effect the point of the bow was 10 mm below the waterline. I made the boat with a case where I could change the keel position as I was concerned that it may nose dive very badly. I guess the first thing I noticed was that when the boat nose dived it did not slow down in fact almost sailed faster when bow was going under! So the forward keel position was best. 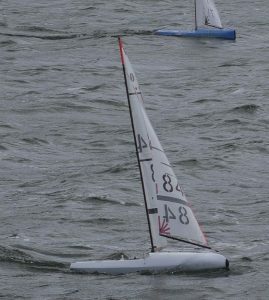 The boat proved to be very fast especially in heavy weather with B and C rigs. However, when training against Spitfire with A rig it became very noticeable that D1 Yellow Submarine could not tack so fast and also was not tracking the wind like Spitfire. The boat would keep sailing in a straight line when it got a knock or a lift so I constantly had to steer the boat while with Spitfire Nathaniel could let go the controls and the boat would steer to the wind! What was happening was the bow of my boat was acting like a rudder so while it was going fast I was missing out badly when the wind changed. So it became obvious to me that I had to change the bow sections. I studied the super quick V8 and designed a similar bow. I cut a ‘v’ on both sides of the boat and again, using female molds, I strip planked balsa the new bow section. I was pleased that the actual change in the bow did not interfere with any of the fittings on the boat. D1 Yellow Submarine performed like a different boat, so we now call this design D2. It tacks way better and tracks better now in all conditions. It took a while to realize that the D3 was still not on the pace . I often blamed my own sailing ability for not getting good results! D3 finished mid fleet at 2014 nationals so still a long way off the front group. It really does take a long time to understand the differences in performance in hull design because of so many variables. Wind conditions, wave conditions, foil and rudder design and positions on boat, sail shape, mast configuration and the list goes on. The D4 was designed with round sections aft compared to the D3 and I think this creates less drag. Max beam is the same as D3 at 185 mm . I wanted the narrowest waterline beam that I possibly could get and to do this I was finding I had to have very full sections along the keel line rather than v sections! The bow is a very full section, almost a scow . 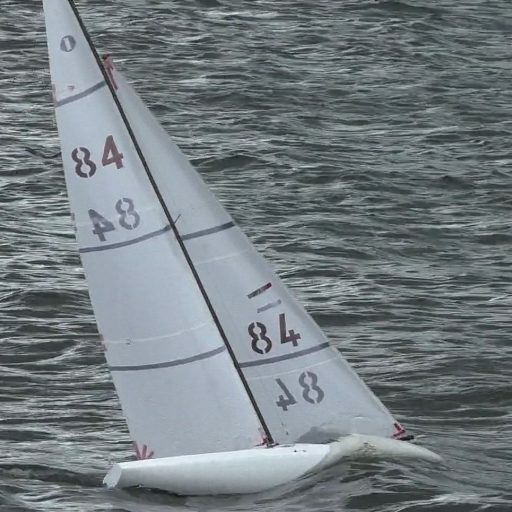 It was very apparent to me that a successful bow shape will be one that will want to lift quickly however at the same time does not have too much buoyancy that the boat will trip over and stop downwind. There is a very fine line with the correct amount of buoyancy in the forward sections to enable the boat to do this . Too thin the boat will dive too far and too full the boat will trip . First off we built two boats with two different bow shapes . One had more roundness and buoyancy on the deck! I have spent a lot of time analyzing the design and still think it is a very good shape and dont really know what to change to improve it. Also using more twist in the sails and this has helped the boat perform better. These sought of things make more difference to performance than changing hull shape. I soon will make a D4 forum to get feedback from existing D4 owners on ways to improve performance.